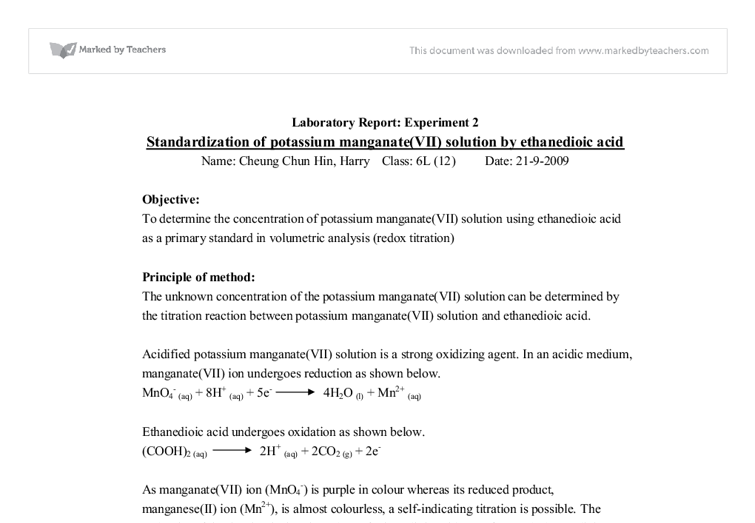 Laboratory Report: Experiment 2 Standardization of potassium manganate(VII) solution by ethanedioic acid Name: Cheung Chun Hin, Harry Class: 6L (12) Date: 21-9-2009 Objective: To determine the concentration of potassium manganate(VII) solution using ethanedioic acid as a primary standard in volumetric analysis (redox titration) Principle of method: The unknown concentration of the potassium manganate(VII) solution can be determined by the titration reaction between potassium manganate(VII) solution and ethanedioic acid. Acidified potassium manganate(VII) solution is a strong oxidizing agent. In an acidic medium, manganate(VII) ion undergoes reduction as shown below. MnO4- (aq) + 8H+ (aq) + 5e- 4H2O (l) + Mn2+ (aq) Ethanedioic acid undergoes oxidation as shown below. (COOH)2 (aq) 2H+ (aq) + 2CO2 (g) + 2e- As manganate(VII) ion (MnO4-) is purple in colour whereas its reduced product, manganese(II) ion (Mn2+), is almost colourless, a self-indicating titration is possible. The end-point of the titration is that the colour of ethanedioic acid turns from colorless to light purple which means there is the first drop of excess potassium manganate(VII) solution. Potassium manganate(VII) solution does not oxidize ethanedioic acid at low temperatures. ...read more. solution and ethanedioic acid: Mass of weighing bottle + solid ethanedioic acid = 4.86g Mass of weighing bottle = 3.99g Mass of solid ethanedioic acid used = 4.86 - 3.99 = 0.87g 1 (Trial) 2 3 Final burette reading 43.55 36.90 40.50 Initial burette reading 13.55 7.65 11.45 Volume of KMnO4 used (cm3) 30.00 29.25 29.05 Calculation: The first trial was not involved in calculation since it is not accurate. 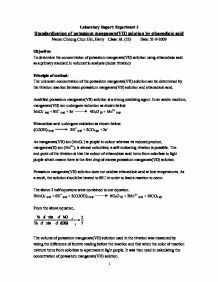 Average volume of potassium manganate(VII) used = 29.15 cm3 Discussion: It was found that the concentration of the given potassium manganate(VII) solution was 0.0095M and this result is quite acceptable because the titration results are consistent. There are still some errors in the experiment. First, the temperature of the reaction mixture was just roughly taken by the feeling of the palm. This feeling was different with different people. If the temperature was too low, the end-point of titration may arise early since the reaction stopped before the ethanedioic acid was all reacted. Also, if the temperature was too high, the ethanedioic acid may decompose and so reduce the number of moles of ethanedioic acid in the reaction mixture. ...read more. ion which was nearly colorless. When all the ethanedioic acid was reacted, the adding of first drop of potassium manganate(VII) solution would lead to a permanent light purple color to the reaction mixture. Since a change of colorless to light purple was sharp and clear to observe, this could indicate the end-point of the titration Therefore no indicator was necessary in this titration. However, if dichromate(VI) ion was used instead of manganate(VII) ion in the titration, dichromate(VI) ion which was orange in color would be reduced to chromium(III) ion which was green in color. At the end-point, it was difficult to observe the first excess drop of potassium dichromate(VI) solution in the reaction mixture since the orange color of dichromate(VI) ions was covered by the green color of the chromium(III) ions. Even if an indicator was used, the color change of indicator would also be covered by the green color of the chromium(III) ions. Thus if dichromate(VI) ion was used, the end-point of titration reaction could not be indicated neither with or without an indicator. Conclusion: The unknown concentration of potassium manganate(VII) solution was deduced to be 0.0095M from this experiment. The result was acceptable and thus the objective of the experiment has been fulfilled. - End of Report - ?? ?? ?? ?? 1 ...read more. For example, if the temperature is increased from 293K to 303K, a change from 20 to 30°C, the factor increase can be calculated as follows: 300 310 = 1.016 This is an increase of 1.6% for a temperature change of +10°C. ?H = (volume of NaOH + CH3CO2H) x 4.18 x (final temperature- initial temperature) = (50+19) x 4.18 x (32.5 - 25) = 0.0 69 x 4.18 x 7.5 = 2.163 KJ Q5: Calculate the standard enthalpy change of neutralization for each reaction. To get rid of the heat to surroundings, we use the vacuum flask instead of the polystyrene cup to prevent heat loss by radiation. Cover the cup by a plastic lid to prevent heat loss by convection. Moreover, we can place the cup on the heat-insulating plate in order to reduce hest loss by conduction. Then the end point is shown by the complete decolorization of the blue color. Page 4 (3)Sometimes black precipitate may appear in the brown solution. (a) What is the precipitate? (b) Why it is formed? (c) What should we do if the black precipitate appears? burette 24.3 cm3 30.6 cm3 27.4 cm3 28.5 cm3 Volume of potassium manganate (VII)used 17.6 cm3 17.3 cm3 17.3 cm3 17.3 cm3 Average volume of potassium manganate (VII) solution used = 17.3 cm3 17.6 cm3is rejected because this is just a trial. Primarily, this is the dependent variable being studied. Volume of sodium peroxosulphate Na2S2O8 solution used The volume of sodium peroxodisulphate will be fixed at 5 cm3 throughout the experiment. Volume of sodium thiosulphate Na2S2O3 solution used The volume of sodium thiosulphate used will be fixed at 2 cm3 throughout the experiment.